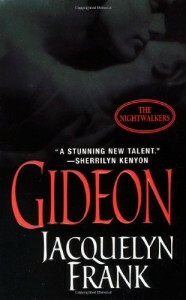 Gideon is book 2 in Jacquelyn Frank's Nightwalkers series and features the story of Gideon, the oldest demon in existence and Magdelegna, the king's youngest sister. Gideon and Magdelegna are no strangers to one another and have interacted often until Gideon, under the call of the moon has a chance encounter with Magdelegna while out of control of his desires and takes advantage of her...though not in the sense that I would have liked for him to take advantage of me (hee hee). Outraged at himself for losing control, he lashes out at her and deeply wounds her pride. Cue Legna being short and curt with Gideon and thus begins the cycle of angry responses between the two which really only fuels the flames of desire they harbor for one another. After years of avoiding and/or being coldly pleasant to one another when they must interact, the two discover they are imprinted mates, destined for one another and the first demon imprinted couple to exist in centuries. Gideon is my favorite book in the series because Gideon is not your typical paranormal hero that's uber alpha male who goes all me man, you woman....you do as I say! Instead he is more of an intellectual and sensual being that recognizes his limitations early on and finds ways to communicate his feelings with Legna in a way that helps her make peace with their union. Gideon being the demon medic and also placing strict control over his emotions, suddenly finds himself in situations that are unfamiliar to him, as well as opens him up to a new range of emotions he has never before allowed himself to acknowledge. Legna who is a mind demon with the power to sense and control emotions is the perfect match for Gideon. She is able to recognize his unease with his feelings and desires towards her, and together they are able to work through the intricacies of their relationship. Intricacies that include her being the baby of her family and her brother Noah's best in-house ally because of her unique abilities to calm and soothe those around her. Couple those things with Gideon also being the oldest known demon to their race and you have unhappy siblings involved in their union.